I remember when I first saw these at the Toy Fair. What a welcome sight to see really intriguing toys that worked for the car. During the summer time, you usually see more reviews for toys and games that can travel with you. I suppose that is good but for me, I think that travel toys are essential all year long. However, it's not like we are only on road trips during the summer. We are always in a car and those short-distance rides over a period of time are actually great times to introduce good travel toys because everyone knows what is the real "problem" here: video games. Video games are always played during those short spurts of time which is really challenging if you think about it. Short spurts usually doesn't satisfy and usually you meet resistance. But there is no denying the ease of video games. It makes us feel so guilty and yet it's hard to make changes. But for those of us who want to give it a shot, I think summer is a great time to make your attempt. If you have a child six or older, Travel Tangoes is a great way to make your first attempt to divert your child's attention from diversions powered by electricity. Number 1 said that this looks like me getting married. How about magnetic power as an alternative to video games in the car? I was thinking about this two weeks ago. A reader emailed me, quite concerned about her 4-year-old taking a very long car trip. 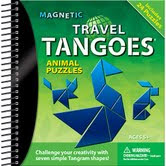 If he was old enough, I would have suggested Travel Tangoes by Smart Toys and Games or as my son calls them, "Trangoes." 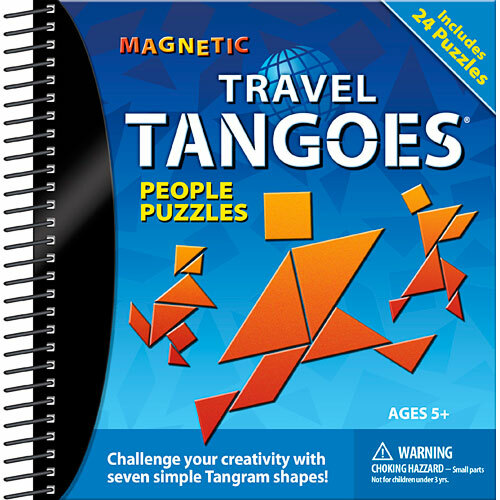 First of all, Travel Tangoes is magnetic and that is really helpful. You don't want to lose pieces and this set comes with puzzle cards bound by a spiral that is attached to a magnetic playboard and the whole thing can be buttoned up so that it turns into the size of a CD cover. But what is probably the best part is that it literally is a puzzle and has a lot to do with how your child sees things. 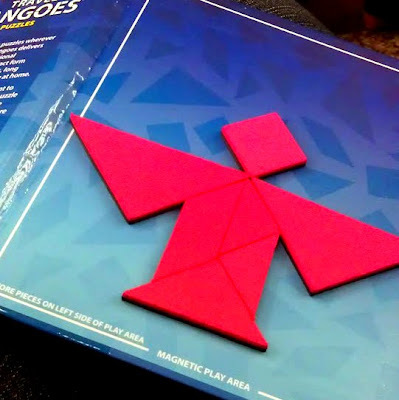 You want them to look really closely and try to figure out how to make the shapes and make it into the shape the puzzle card is asking you to do. Believe me, this is not easy for some. 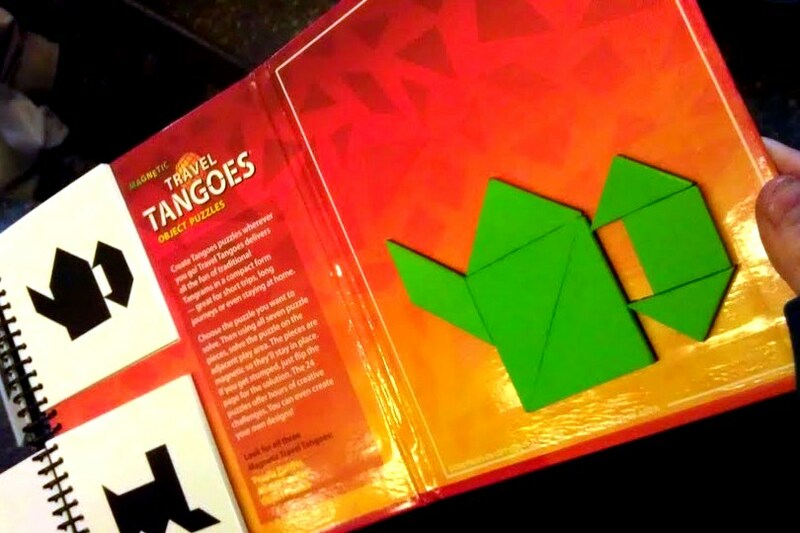 Each Tangoes puzzles comes with seven pieces that can form into a square. You must replicate the shape on another board and not on top of the picture. There are 24 puzzles with solutions on the back. Try to flash peek to get a hint but not the whole answer. But there are some kids who are just good at this game. For those kids, Travel Tangoes can work well as a travel toy because it's not an easy puzzle, thus you have to make sure you are going to give it to kids who like this kind of challenge. 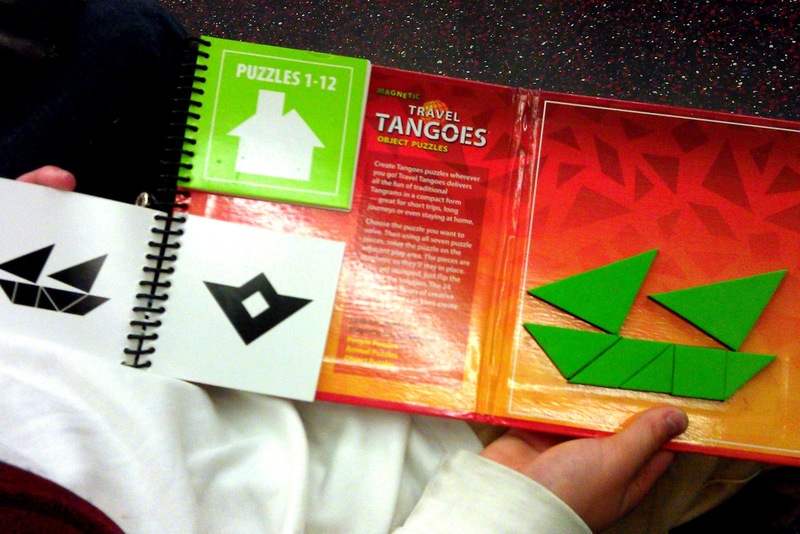 Click here to try a printable tangram puzzle. Number 1 Son definitely liked these. He actually found the People and Animal Tangoes harder but he really liked the Objects puzzle. I found myself quite incapable of doing most of all three puzzles. But I was curious to figure out why my son was able to do the Objects puzzle better. David Wells, Manager, Creative Making and Learning, New York Hall of Science told me that the reason he did so well with Tangoes Objects is because we are able to see simple shapes in objects such as couches and bookshelves so much more easily than we can in living things like animals or people. 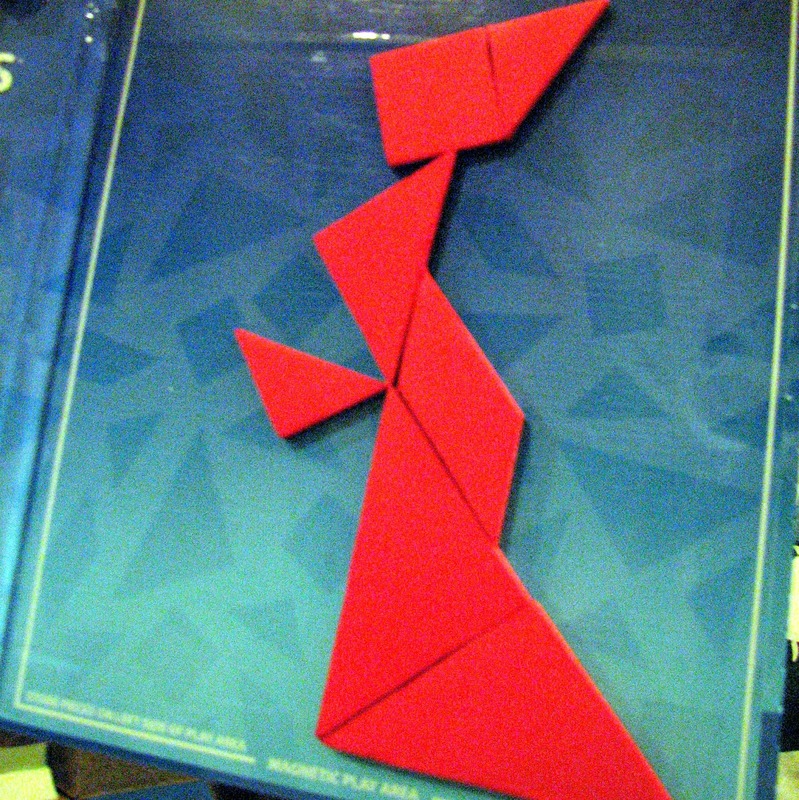 David suggested that kids try working with the pieces on their own and make their own creations. That happened with my son too. He started to make his own after a while. David went on to suggest that Smart Toys and Games could actually create a contest for kids to submit design ideas using Tangoes. I love that idea. Contests motivate kids and there just aren't enough contests for kids who have an affinity for visual-spatial games. 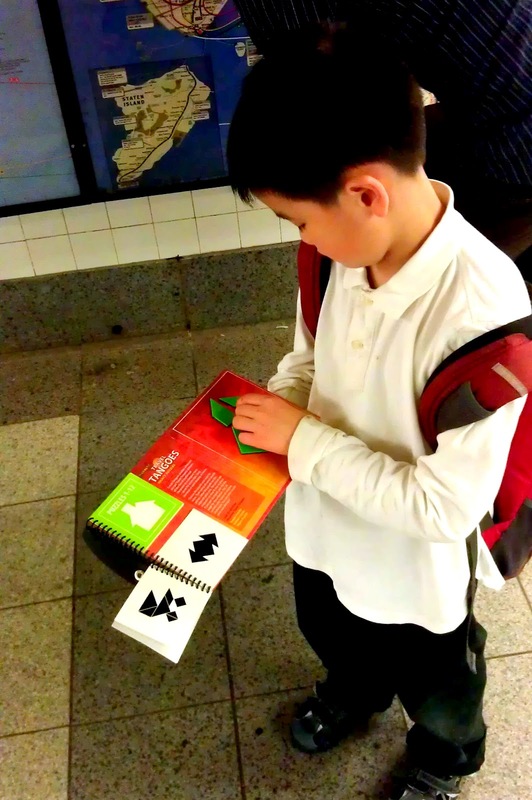 If your child is not used to playing with puzzles in the car by himself, introduce it by sitting next to him or doing it outside of the car first. 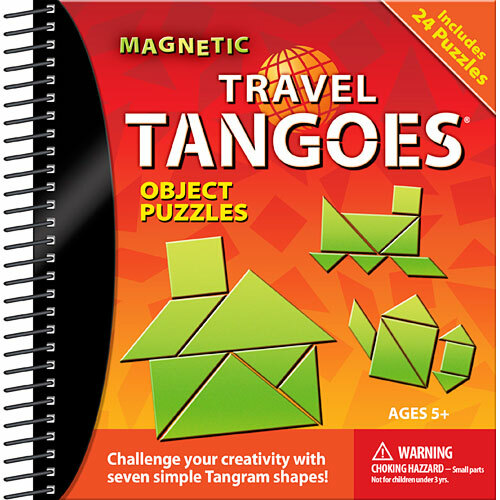 But aside from me liking Tangoes because of its Chinese origin (we are an Asian American family), what's there to like about these magnetic shapes? What skills are we learning here? "You are actually creating something that you are able to interpret," David said. "I think utilizing the way you see things, how you break things down, how you take things apart, and how you put them back together is something that is a skill." "It gives you a kind of connection but it also gives you the ability to break things apart," David said. We first played with our in the subway where we could sit alongside one another and it wasn't unusual to do so. No wonder my son likes it! He loves breaking things apart!!! 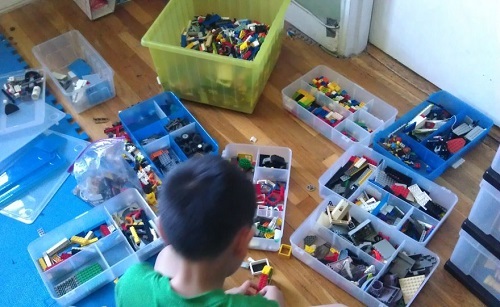 I still remember the first time he took apart a toy. He just broke open a battery-operated toy truck. It was one of those cheap cars you buy off the street. I was just shocked because he didn't try to screw it open. Oh no, he just cracked it open. Nice! Oh well, at least it wasn't our television. 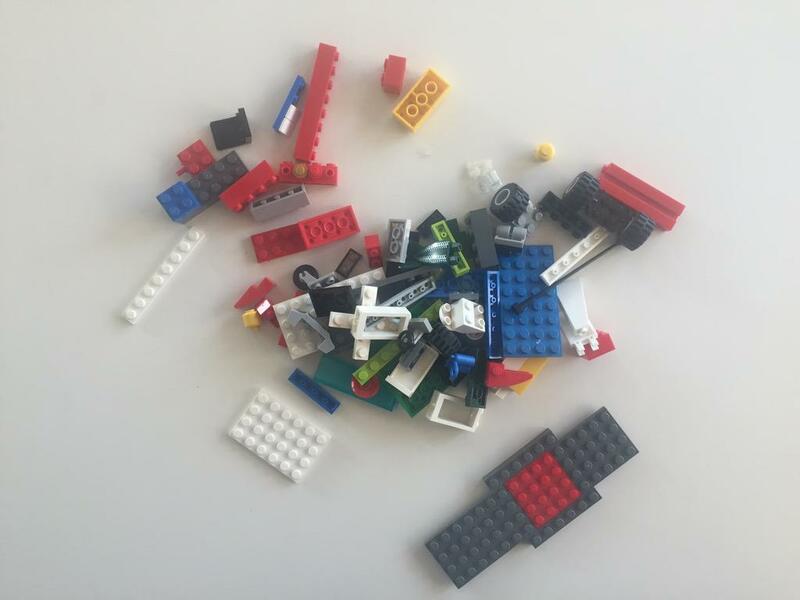 But taking things apart, David said, is really part of understanding systems. "What is a system? 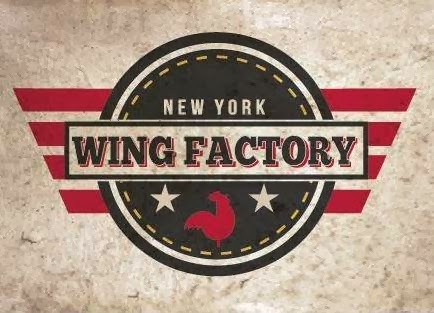 It's a couple of parts working together to create something bigger." Through this exercise, we're not so much creating a skill he told me, but rather, we are creating an understanding. I suppose that is the beauty in breaking things apart. I wasn't thrilled that he cracked open a simple toy car but I suppose that was a prelude to doing well with Travel Tangoes and that playing with Travel Tangoes may serve as its own prelude to breaking a more complicated cheap toy car. Either way, I definitely do encourage that if the kids find the puzzles too hard, then to deconstruct by looking at the answer keys or even doing what David suggests by completely doing your own thing. Hopefully the more they break apart and put back together, the more they will train their minds to see how anything and everything can work together. Where Can You Find Travel Tangoes? Try My Amazon Links and put one in your shopping cart today! Disclosure statement: Toys are Tools has not been compensated in any fashion by the manufacturer or retailer of any of the mentioned products for the publication of this post. 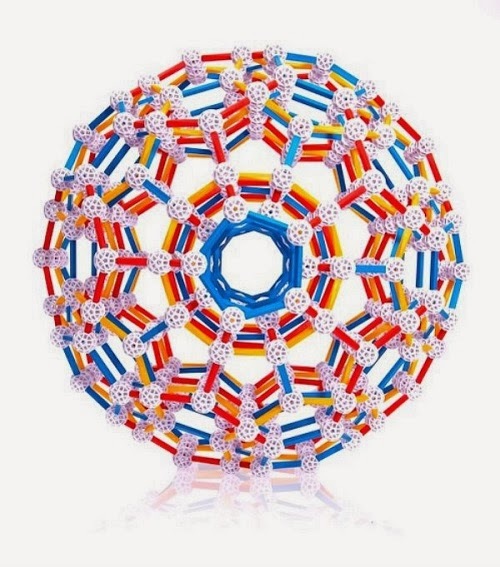 The product was given to Toys are Tools' testers to facilitate a review. Reviews are never promised. I love this idea! I have a felt Tangoes set I made for my son as part of his quiet book and it can keep him entertained for hours. This will be more challenging for when he gets older and would be great for the car! Psychologists have determined that a child’s brain development is influenced significantly when a child acts on or manipulates the world around him or her. Puzzles provide that key opportunity.